Luke Skywalker felt safer when R2-D2 was flying behind him and All Nippon Airways (ANA) hopes passengers will feel the same way when it introduces Star Wars livery, with the iconic R2-D2, on its newest aircraft, the 787-9 Dreamliner, as announced at the Star Wars Celebration in Anaheim in April. 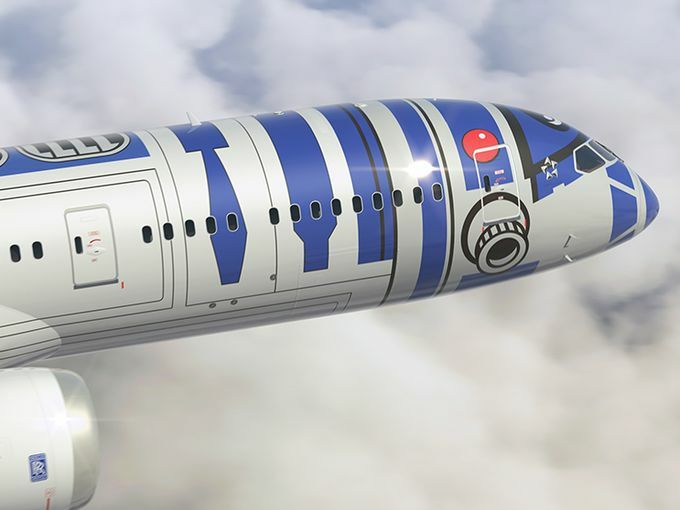 “The R2-D2 motif works well with ANA’s blue logo design on the aircraft’s fuselage, and many people associate R2-D2 with competent and reliable service-also hallmarks of ANA’s 5-star service,” said Takashi Shiki, ANA Executive Vice President, Sales & Marketing. 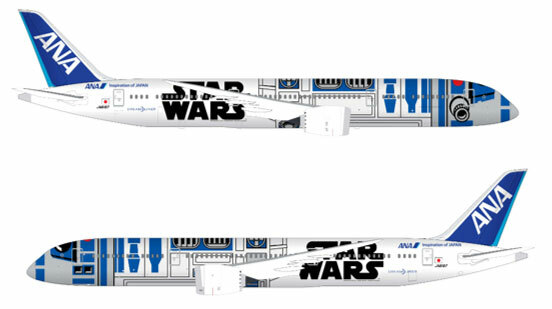 This will be the first time a Star Wars character will appear on the exterior of a commercial aircraft, and marks the beginning of a five-year ANA Star Wars™ Project and agreement with The Walt Disney Company (Japan) Ltd. The design will appear on one of ANA’s Dreamliners this fall, though the carrier has not yet determined what routes it will fly. This entry was posted in Skiffy and tagged R2-D2, Star Wars by Mike Glyer. Bookmark the permalink. I showed my son the pictures above, he became concerned that the passengers on the plane would end up in space. If only!